SPECIAL PRICES MAY AND JUNE! The house has a big kitchen, a comfortable living room with a satellite flat screen TV and a double sofa bed. There are two bathrooms and three bedrooms in the house: two spacious double bedrooms - one with private bathroom and Jacuzzi - and a bedroom with 2 single beds (or one double bed, as you prefer). 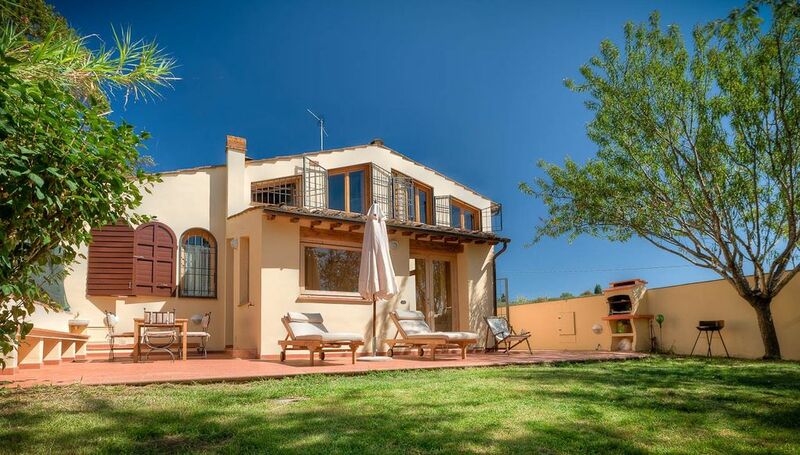 Guests have at their disposal a private swimming pool surrounded by olive trees and valley view, a garden with table and chairs and a barbecue area, perfect for al fresco dining on a hot summer day! While retaining its rustic charm, the Casa Il Fienile is equipped with all amenities, including air-conditioning and Internet wifi. Our names are Vittoria and Marco, we live close to the Casa Il Fienile. Vittoria is a florentine tourist guide and Marco is a professional writer. We love nature, art, met new people and cultures, taste good food and good wine !! We live close the Casa Il Fienile and we will respect your privacy. We can give you good advice about activities to do in Florence or in Chianti, and addresses of good restaurants in the area. Set in a beautiful and quiet location in the Chianti hills, Casa Il Fienile is equipped with everithing you need. Just 12 km south of Florence, Casa Il Fienile is an idyllic location for a relaxing holiday with your family and friends. The house can host until 8 persons. Private swimming pool. Pets are welcome!! possibility to call landline numbers in all EU, USA, Canada. We were a family with teenage children. The villa was well appointed and Vittoria could not be more helpful, from arranging trips to booking restaurants. The pool was the best thing about the villa as far as the children were concerned. It is close enough to drive into Impruneta but also further afield as Pisa and Florence are both in easy reach. We had a lovely stay, thank you. We had a great week at Vittoria's house. We used it as a central location to tour around to all of the areas of Tuscany. The house is only about 20 mins outside of Florence for easy in and out of the city. The house is very nice with spectacular views from the upstairs bedroom and pool. The area is very quiet. Vittoria provided great tips for local restaurants and other services. Would highly recommend if you would like to be close to Florence but still in the country. This property practically sums up all one wants from a holiday. Beautiful, well-maintained, extremely high standards, clean, excellent customer service. It is twenty minutes away from Firenze, and yet immersed in beautiful countryside with breathtaking views. It is equally suitable for those who want a restful holiday, as well as for those who want to go around to discover the area, or even enjoy outdoor activities. The owners, Vittoria and Marco, are always available and go out of their way to help, suggest and ensure their guests enjoy themselves. We highly recommend it. Grazie mille!!! Siamo contenti che siate stati bene a Casa il Fienile! È' stato un piacere conoscervi . We only stayed for four days, but could happily have stayed for our whole holiday. Florence, Pisa, Sienna and some lovely parts of Tuscany are very close. Vittoria was very friendly and helpful. The owners live close by, so are on hand if needed. Although we didn't need anything because everything was perfect. Lovely area to explore and great to have a pool. We only stayed for four days, but would happily have stayed for our whole holiday. There were incredible views from the villa and it was in a convenient location to visit Florence, Pisa, Sienna etc. Vittoria was very friendly and helpful. The owners live nearby so they're on hand if needed, although we didn't need them because everything was perfect. Lovely area to visit and great to have a pool. Fast zwei Wochen haben wir zu viert die Toskana genossen. Das Haus zeigte sich so wie beschrieben und gab uns ein sehr behagliches und sehr gemütliches Zuhause. Nicht nur die günstige Lage (dicht bei Florenz, mitten in Olivenbergen), auch der schöne Garten mit herrlicher Aussicht hat uns überzeugt. Die Vermieter waren jederzeit ansprechbar bei Fragen, drängten sich aber nicht auf. Wir würden jederzeit wiederkommen!!! Herzlichen Dank für die sehr schönen Tage mitten in der Toskana. Towels and bed sheets are included. Shimming pool towels are aslo included. Electricity and gas fees are INCLUDED.